This millet grain bowl is a nice change from the regular grain bowl you see. Millet is simple to make and has a wonderful flavor. You can grind the grain and turn it into a flour. It cooks just like rice – 1 cup of millet/ 2 cups liquid. I had made some Easy Falafels and the Creamy Cilantro Sauce/Dressing for dinner the night before. To change it up a bit I used those ingredients and a few others to make this flavor packed grain bowl. 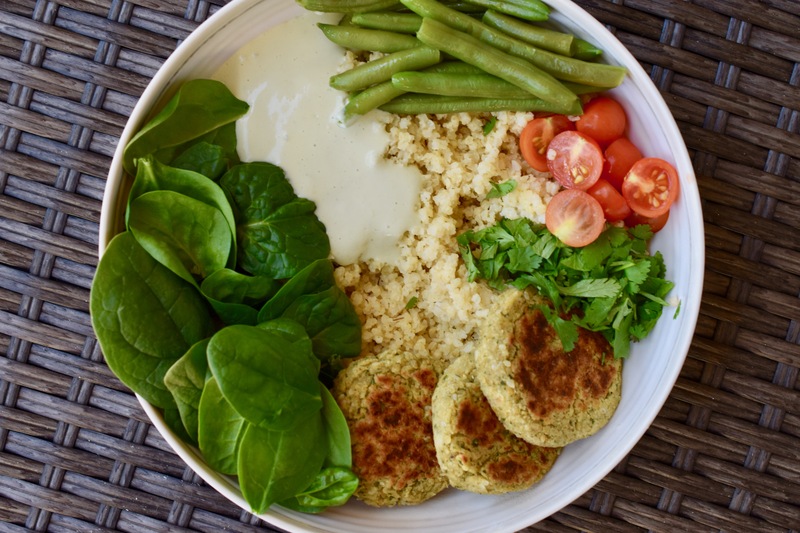 This recipe makes two bowls with extra Creamy Cilantro Sauce/Dressing and extra Falafels. Assemble the bowl in the order of the ingredients.